Spinning 390 times a second, the "black widow" pulsar PSR J1311−3430 periodically swings its radio (green) and gamma-ray (magenta) beams past Earth in this amazing space wallpaper. Spinning 390 times a second, the "black widow" pulsar PSR J1311−3430 periodically swings its radio (green) and gamma-ray (magenta) beams past Earth in this amazing space wallpaper. 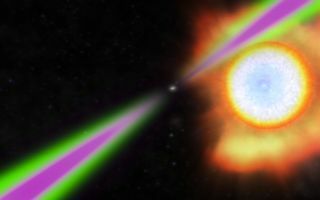 The pulsar heats the facing side of its stellar partner to temperatures twice as hot as the sun's surface and slowly evaporates it.